You might have guessed that we love companies that give back. Whether through supporting a buy-one-give-one model, purchasing local, seeking out companies that have a positive impact on the environment or a commitment to treating their employees well, there are so many opportunities for us to “vote with our dollars.” We know that choosing to be a conscious consumer can be overwhelming at times, so we’re here to help. In this series, we’ll show you how to stock up with socially responsible products in every area of your life, from planning a vacation to preparing for a new baby. First up, what to carry: we’re sharing the socially responsible brands that fill our FEED bags with goodness. BITE Lipstick We love BITE because it checks all our lipstick boxes: beautiful color, long lasting, all-natural. The company was founded on a guiding philosophy that says, “You eat what you put on your lips, so your lipstick should be good for you.” Amen. All of their moisture-rich lip products are made with food-grade, antioxidant ingredients that are good enough to eat. They also are committed to creating products at low temperatures to retain the natural benefits of organic ingredients. S’well Water Bottle We believe that water does not and should not come out of a bottle, so no matter where we go, we bring a reusable water bottle with us. S’well’s mission is to rid the country of water bottles and in the process works closely with UNICEF in order to improve access to healthy water around the globe. Clarins Mascara Clarins’ Be Long Mascara is one of the most sworn-by beauty products in our make-up bags. It somehow makes even the most minimal lashes look long, full and glossy. Not only do we love the product, but Clarins has also provided over 6.6 million meals to children globally through our ongoing partnership. 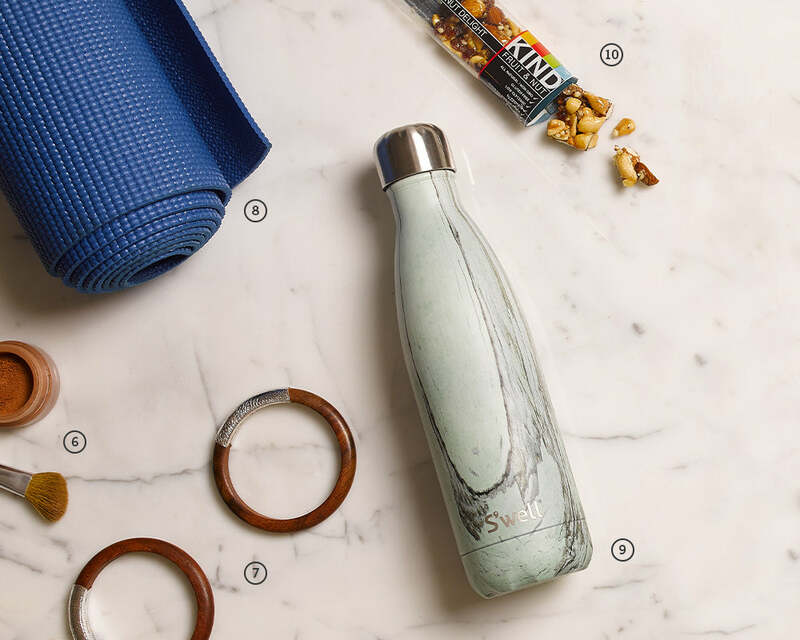 KIND Bar We can’t leave the house without packing something to snack on. We have been hooked on KIND Bars for years, since our office manager started stocking the kitchen drawers with them. KIND Bars are made from ingredients you can “see and pronounce,” which we really appreciate. They are also delicious and easy to eat on the go en route to a meeting across town. Warby Parker Sunglasses There are a lot of sunglasses brands to choose from. We wear Warby Parker because they are changing eye care around the world. They donate a pair of glasses forevery pair they sell, and they train individuals in developing countries to practice eye care and sell glasses to their respective communities. We also have a thing for their commitment to great design. TOMS Marketplace Bracelet TOMS is one of our favorite brands because of its strong social conscience and proven impact throughout the world. The purchase of this bracelet alone helped an orphan get to school safely for six months. Now that’s a reason for an arm party. Rawganique Yoga Mat Team FEED has a lot of yogis who buy their mats from Rawganique because they are made sustainably and free of harsh chemicals. Om without guilt. 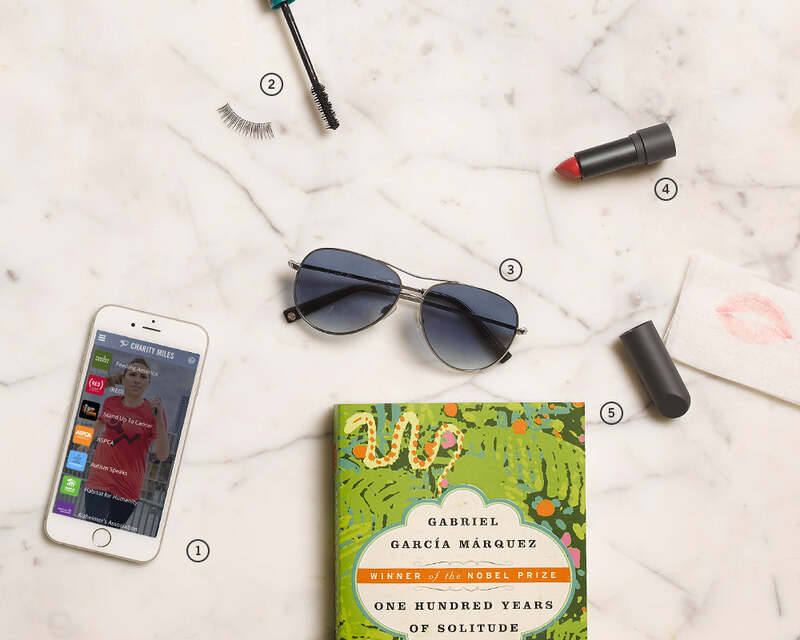 Gabriel García Márquez’s One Hundred Years of Solitude Since most of us take the subway to work every day (fighting back envy of the walkers among us), we’re always carrying a book. This book started making its way around the FEED HQ a few years ago and it’s still a favorite. Márquez’s vivid language tells the story of Mocando, a fictional village, through the lens of generations of members of the Buendía family. It is brimming with love and war, birth and death. While fictional, the story is startlingly relatable. Colorescience Pro Sunforgettable Mineral Powder SPF 50 Powder Brush Sunscreen is the new spray-on. It’s easy to apply and super effective. Colorescience is awesome because they’re committed to healthy formulas so we don’t break out when we use it. Also, they work with Sunstoppable, an organization that teaches people how to stay safe in the sun. Charity Miles Mobile App The runners on our socially conscious team swear by this app. It’s pretty cool: just log your run or bike ride and you’ll automatically raise money for your favorite charities. Bikers earn up to $0.10 per mile; walkers and runners earn up to $0.25 per mile, courtesy of the app’s corporate sponsors (so you don’t even have to harass your friends to donate). If this isn’t inspiration enough to get in running shape, we don’t know what is!